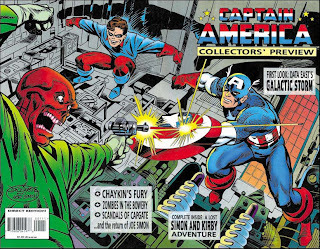 The Marvel Age of Comics Tumblr (which I think is run by Tom Brevoort, but I'm not sure) has a post that showcases this old Jack Kirby drawing. 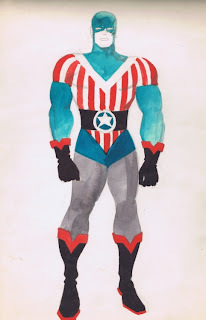 The Tumblr post states that it was "A proposed redesign of Captain America by Jack Kirby done during the period in the 1960s when Joe Simon was waging a court battle to regain rights to the character." I'm not so sure. It's certainly a possibility, but the thing is, I remember when this drawing first got published. 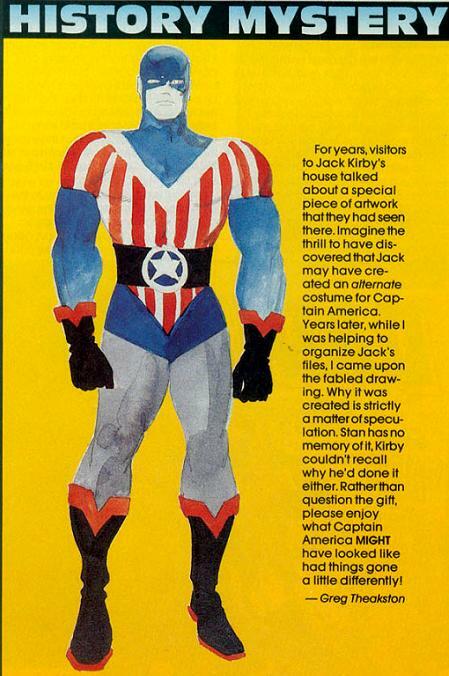 It was in CAPTAIN AMERICA COLLECTORS' PREVIEW, back in 1995. That's John Byrne on pencils and Joe Simon on inks. It was right in a little inset called "History Mystery" by Greg Theakston. Apparently, the drawing had become something of an urban legend, and it finally saw print back in 1995. Let's look at those words again. 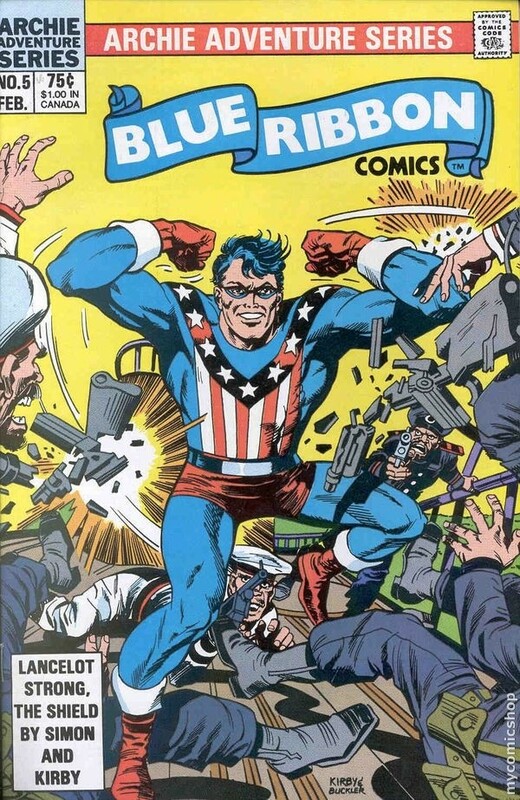 "Jack may have created an alternate costume for Captain America." "Why it was created is strictly a matter of speculation. Stan has no memory of it. Kirby couldn't recall why he'd done it either." Keep in mind that Captain America isn't the only patriotic superhero that Jack Kirby co-created with Joe Simon. 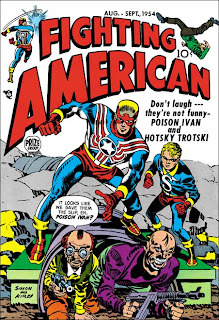 In 1954, they created the Fighting American, who started out as deadly serious but quickly became really satirical in light of the Cold War. 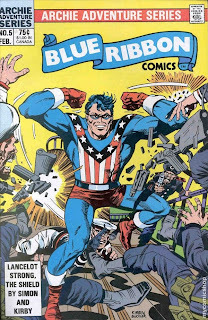 The Fighting American's been through a lot, but is co-owned by the Kirby and Simon estates. In 1959, they created a successor to Archie Comics' superhero, the Shield. The second Shield was named Lancelot Strong, who was actually one of the first superheroes I ever encountered. 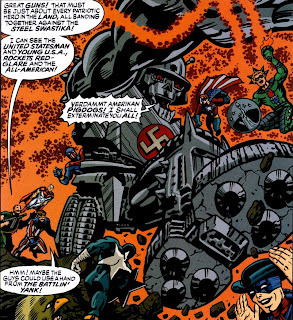 In fact, when Alan Moore and Rick Veitch did their tribute to Jack Kirby in SUPREME: THE RETURN, this was one of the panels. Let's also not forget the story from a couple of years back when the people at Ruby-Spears found a gigantic stack of previously unused, unseen Kirby concept art. Apparently, they didn't give him enough to do, so he just kept drawing and drawing and drawing. 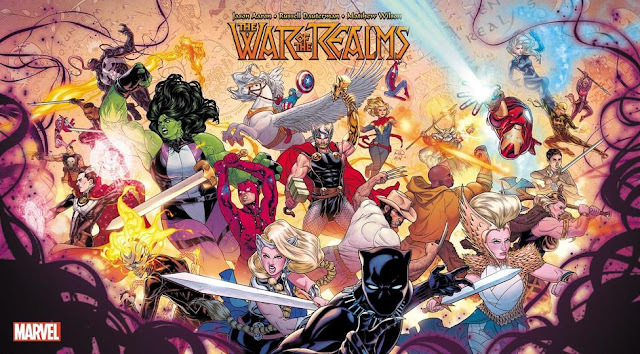 The point is, Kirby just drew a lot. 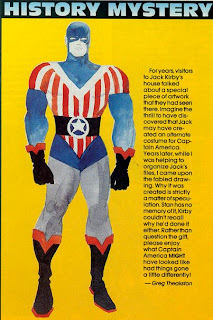 Legend is almost undoubtedly going to perpetuate the initial drawing above as a redesign for Captain America that Jack did, but I'm not convinced. Could it have been such a thing? Yes. But it could have been a redesign for the Fighting American, a redesign for Lancelot Strong, a doodle he did, or a new character he was working on altogether. I see nothing that would tip the scales towards one likelihood and away from any of the others.